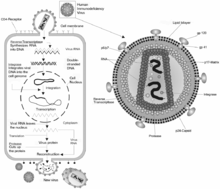 Retroviridae is a family of enveloped viruses that replicate in a host cell through the process of reverse transcription. A retrovirus is a single-stranded positive-sense RNA virus with a DNA intermediate and, as an obligate parasite, targets a host cell. Once inside the host cell cytoplasm, the virus uses its own reverse transcriptase enzyme to produce DNA from its RNA genome — the reverse of the usual pattern, thus retro . This new DNA is then incorporated into the host cell genome by an integrase enzyme, at which point the retroviral DNA is referred to as a provirus. The host cell then treats the viral DNA as part of its own genome, translating and transcribing the viral genes along with the cell's own genes, producing the proteins required to assemble new copies of the virus. It is difficult to detect the virus until it has infected the host. At that point, the infection will persist indefinitely.